I love getting little reminders every so often that no matter how long I have been teaching, I am just a few steps down the path. Why do I love these reminders? Because teaching violin is one of the toughest nuts I have ever tried to crack … and I love cracking nuts. 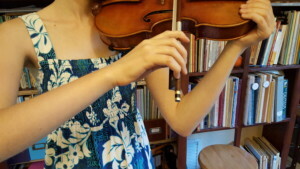 Although I teach my beginning students how to flex and re-curve their bow-hand pinky even before they begin on the violin, about a month ago I noticed that 6-year-old Rose, who is midway through Book 1, no longer had a beautifully flexible bowhold as she played. Instead, the pinky-side of her bowhold was a permanent triangle, with her pinky and ring finger straight. 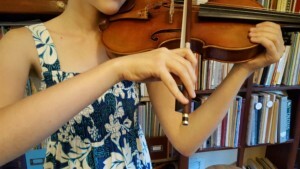 Of course teachers are used to seeing this bowhold … it is very popular among young violinists. The extended pinky on the bow hand is fine at the tip, but in the middle the pinky should be curved. 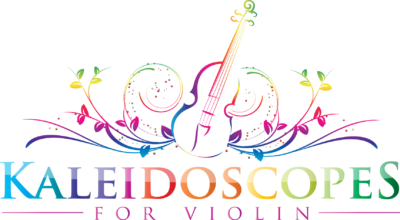 For most violinists (unless we have VERY long arms), when we travel to the tip of the bow, our pinky, ring finger and thumb must release their curve to allow us to reach the tip. This is a passive movement which will happen naturally if our hand is relaxed. However, if a student is not trained to consciously re-curve the fingers when they return to the middle of the bow, their pinky will stay straight and the back of their hand will form a peaked, triangular shape. This peaked hand shape is correct at the tip, but results in crooked bowing everywhere else. What was unexpected is that this was occurring after I thought Rose’s flexibility had been established. Even though she could still extend and re-curve her pinky on a pencil, and even though her bow form had been working well for many months, somehow she had lost her ability to flex her bowhold while actually playing. As I mentioned earlier, I teach an exercise called “Flap Your Wings” to all my pre-Twinklers, in which they make a bowhold on a pencil and practice extending and re-curving the pinky. Rose had passed this with flying colors before even touching a bow. However, she was now getting “stuck” in extended position and could no longer find her pinky to re-curve it. Or rather, she could find her pinky, but she couldn’t find her knuckles, which were stuck in “up” and preventing her pinky from being anything besides straight. Consciously lowering the knuckles allowed the pinky to re-curve, correcting the bowhold. So we devised an exercise called “Mountains and Valleys.” She played a short, full-bow tonalization with two bows per note. When she reached the frog each time, she looked at her knuckles (which were peaked) and flattened them. Because this process required considerable concentration, just 8 times of reaching the frog was the perfect length for the exercise. After a week of doing this, Rose had developed good conscious control over her knuckles. Now the only missing piece was actually lowering the knuckles while returning from the tip to the middle. Her assignment for the upcoming week was now to gradually lower her knuckles on the way to the middle. Happily, she was able to do this successfully the first time she tried … as long as she was concentrating and watching her bow hand. The difference? “Flap Your Wings” puts attention on the extending and curving of the pinky. “Mountains and Valleys” puts attention on the upward and downward movement of the knuckles.